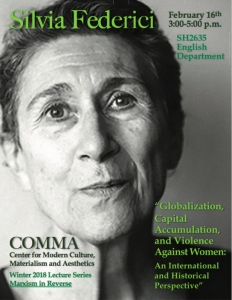 Silvia Federici is an internationally recognized feminist philosopher and activist, and one of the most important political theorists today. She is one of the founders of the Network for Wages for Housework, and the author, among many other books, of Caliban and the Witch. Included in this email are a link to an interview with Silvia Federici and a suggested reading. and the Center for Medieval Literatures.